The affluent continually look to push the boundary of luxury living. It’s not just about keeping up with the Joneses, but beating them. Now you can enjoy an incredible opulent event and partake in the world’s most expensive dining experience for a jaw-dropping $2,000,000! The WORLD OF DIAMONDS Group is Russian conglomerate and one of the largest privately held diamond mining corporations. They have been involved with some of finest diamonds and jewelry pieces sold around the world. In addition, WORLD OF DIAMONDS Group introduced The Royalé Dream. It was the world’s most expensive perfume collection and was sold last year in Singapore. Now in 2016, Singapore again is the place where a new record will be broken. Two people can be part of world’s most expensive dining experience for $2,000,000. WORLD OF DIAMONDS Group collaborated with CÉ LA VI Singapore. This ultimate fine dining restaurant is owned by L Capital Asia. The Asian private equity business is actually part of the Louis Vuitton Moet Hennessy (LVMH) Group. This VIP experience is actually much more than simply a romantic dinner for two. The luxury package also includes an exhilarating helicopter ride, the ambiance of 10,000 roses adorning the private venue, plus a delicious, 18-course degustation dinner menu. But that’s not all! You’ll be treated to pairings of 44 and 55-year old vintage wines, plus eat with diamond-encrusted chopsticks. While dining, relax in custom-made designer furniture. As you are served your decadent dessert, be presented with a gorgeous 2.08 carat celebrity Blue Diamond ring. The night to remember ends with a fantastic fireworks display. No details have been overlooked and this 8-hour retreat is opulent from beginning to end. You’ll commence your journey with a scenic 45 minute helicopter ride. Take in the beauty of Singapore from the air. Once you land, you will be whisked away VIP style, in a chauffeured Rolls-Royce. Next get on board a luxury yacht for an amazing private cruise. Take in the coastal sites before arriving at CÉ LA VI. As you step out of the hotel’s elevator, you become immersed in literally a sea of 10,000 fresh roses. 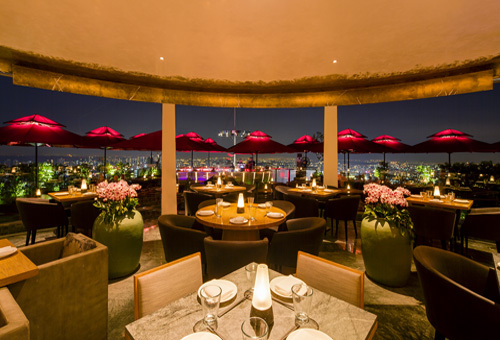 Gaze out the large windows of the restaurant for stunning 360 degree views of Singapore. As the sun sets, your anticipation continues to build. It’s time to begin your 18-course Modern Asian meal. The degustation menu was carefully created. Each culinary item will delight your taste buds as you dine in ultimate privacy. We want to share your mouth watering menu. We’ve also listed each of the 44 and 55 year-old vintage wines that will be paired with your delicious meal. The dinner guests will enjoy their lavish meal using diamond-studded chopsticks. Each pair are actually customized and engraved with their respective names. Dining in ultimate comfort, enjoy your culinary voyage while seated in custom-made designer furniture. Both luxury, grand armchairs were fabricated by The Plush. As your world’s most expensive dining experience nears its climatic end, there’s another surprise in store. When the clock strikes midnight, a spectacular fireworks display begins. The sky lights up, capping the , enjoy the smooth taste of Louis XIII de Rémy Martin cognac. One last note, simply having $2,000,000 is not enough. If you are interested in the world’s most expensive dining experience, only “qualified individuals” will be approved. This unknown criteria will at the discretion of both WORLD OF DIAMONDS Group and CÉ LA VI. The Life of Luxury wants to make dreams come true. Our luxury concierge specialists can put together incredible VIP experiences for any occasion. For example – a honeymoon, anniversary, birthday and more! The sky’s the limit. Let your imagine go wild and let us make it happen. If you would like to be part of the $2,000,000 world’s most expensive dining experience, please contact us immediaitaly. Come back again soon to follow our popular luxury blog. We enjoy sharing the best in luxury living.